For your pet's safety, dogs must be on a leash and cats must be in a carrier. On-premise at Diane's. Call (610) 970-4173 for information or visit us online. EARN A FREE SPA PET WASH! BUY 10 WASHES AND GET THE 10th. WASH FREE! 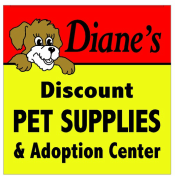 Fill out a Dog License Application, print it, and then bring it to Diane's and we'll submit it for you. Heart worm, Lyme, FELV & FIV testing plus Heartworm Preventative Heartgard Plus.